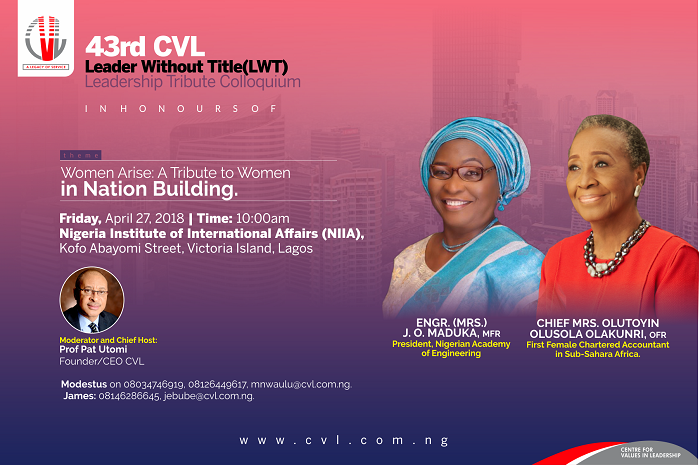 The Centre for Values in Leadership is pleased to invite you to the 43rd CVL Leader Without Title Leadership Tribute Colloquium in honour of Chief (Mrs) Olutoyin Olakunri @ 80 & Engr (Mrs) Joanna O. Maduka @ 77 for their contributions in the development of Nigeria. Chief (Mrs) Olakunri is the first female chartered accountant of Sub-Sahara Africa while Engr (Mrs) Maduka is the first female COREN Registered Engineer. The theme of this colloquium is: Women Arise: A Tribute to Women in Nation Building.